I first met MotoGP's new champion Casey Stoner when he was a young lad slumming it in a camper van in Penrith in the Lake District. His parents had brought him over from Kurri-Kurri in Australia to Europe to help him follow his MotoGP dream, which took him all over England and then Spain. He simply would not be where he is today without the dedication shown by his parents - he owes a great deal of debt to them for the sacrifices they made. He was a quiet little lad back then, much like he is now. He is not at all gregarious and is quite an introvert, but he has a steely determination and focus which is quite unusual in someone so young. His father is the one who saw it in him and that is what drove him to put so much effort in to his son's career. And it has paid off in spectacular style. On his way to winning the title with three races to spare, Stoner has not made any mistakes, which is remarkable for a 21-year-old under the kind of pressure he was facing. It is extraordinary for someone of his age to have been so consistent and so solid all season. I very much hope that next year with tyre issues resolved that there will be slightly less disparity between the top teams. He has finished every race he started, and his worst finish was sixth place in Japan, where he clinched the championship. When he made a strong start to the season I think most people, me included, thought he would make a lot of mistakes as the campaign progressed. But he did not and now the question is, will he go on to dominate the sport? I think he probably will, as he has already achieved so much and he is so determined and hungry for success. I very much hope that next year, with the tyre issues resolved, there will be slightly less disparity between the top teams. We would all love to see a title battle between Stoner, Valentino Rossi and Dani Pedrosa. Stoner will be aware that next season Japanese manufacturers like Rossi's Yamaha and Pedrosa's Honda will be rejuvenated as they have had a kick up the backside this year. 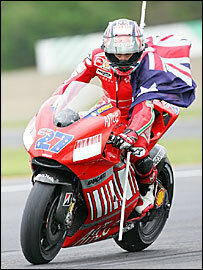 They will come back even stronger, which will make it tough for Stoner and his Ducati. The Italian team became the first European manufacturer to win a MotoGP title for 33 years. That is quite amazing when you look at the size of the team compared to the Japanese manufacturing giants. It is tremendous and something they will be very proud of for years to come. They have been competing with companies that have more resources, more money, more staff, more everything. They will have fired up the Japanese, who are probably a little embarrassed by it all. One of the keys to Stoner's championship win was that from the very first race of the season in Qatar, the whole team gelled. When I say the whole team I mean Casey himself, his bike, his superb Bridgestone tyres, and everyone in the team around him. It has been so harmonious as they have worked and pulled in the same direction and every single component of that team has been faultless. The Italians are true racers, they are passionate about what they do and I think when you look at the whole team, they all give 110%. One of their finest attributes is that they react to anything that is put in front of them very quickly. Ducati and Bridgestone reacted to the winter rule changes quicker than anyone else and came out with a product that was superior to the rest of the grid. Whether they can repeat it again next year is unclear, but there is no doubt Casey Stoner has a long future as a top-line MotoGP racer. The last three races of the MotoGP season will be live on the BBC TV and the BBC Sport website (UK users only).